It is the average Price / Awareness / PR / Distribution / Quality index weighted by the volume of demand for each product. We use a weighted average to give a better indication of the overall level of value for consumers. For instance, if you have two products A and B with A priced at $100 and B at $50, then the average price of those two products is $75, ie. ($100 + $50) / 2 = $75). But for the weighted average we look at the amount of demand for each product. How much should we pay our staff? 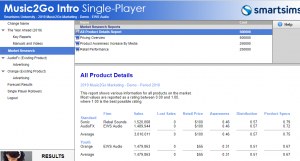 What are the other common mistakes in Music2Go Marketing? In Part Two, we’ll talk about the importance of reaching the right customers and how to better allocate your Sales Promotion Mix. Here’s Part One of the article in case you missed it. Not understanding this can be a costly mistake as it often leads to incorrectly assigning your Advertising Mix. This can have a negative impact on the demand for your products and can also lead to overspending. Meaning your firm’s profitability is at risk! How do you know if you are spending your advertising budget inefficiently? Follow through this section, it will show you how to efficiently allocate your advertising budget. Each market segment is sensitive to different dimensions. View the Market Information report. How do I interpret this Product Dimension Sensitivities graph? The best way to explain it is through an example. If you take the Standard segment, you’ll see it has a high sensitivity to Price. This means that an increase to your price (example setting the price to the maximum) is going to have a negative effect on your sales volume. What these sensitivities mean is a change in any of these factors, will result in a proportionate change in the consumers’ demand for your product(s). There are four media choices to develop your advertising mix on: Television, Newspapers, Magazines and Digital Media. There are two substantial sources of information you can use to determine your optimal advertising mix for a given advertising spend: Advertising and PR Reach by Media Curve and Media Viewing Habits. Both information can be found in the Market Information report. Each media type can reach a given proportion of its audience for a given investment. This is shown within the Advertising and PR Reach by Media Curve. The best way to explain this would be to provide an example. Example: Budget of $4 million on Standard Segment. Option 1: 42% of the Standard Segment read magazines. Option 2: 85% of the Standard Segment can be reached via Digital Media. Option 3: But maybe we can do better than that still. What happens if we spend $2 million on Newspapers, and $2 million on Magazines? If we spend $2 million on Newspapers, we could reach approximately 40% of Newspaper viewers and 58% of the Standard segment reads Newspapers. So we could reach approximately 40% (Media Viewing Habits) x 58% (taken from the graph at a spend of $2 million) = 23.2% of the Standard Segment. If we spend $2 million on Magazines we could reach approximately 50% of Magazine viewers and 42% of the Standard segment reads Magazines. So we could reach approximately 50% (Media Viewing Habits) x 42% (taken from the graph at a spend of $2 million) = 21% of the Standard segment. So, together our $4 million spent half on Newspapers and half on Magazines would reach approximately 44.2% of the Standard segment, which is obviously a better use of our Advertising budget than the first two options. As you can see, with the same budget, but a different allocation towards each media channel can make a huge difference in the amount of consumers you can reach. This is only an example of good and bad marketing mixes. This is far from the best mix you can make. We suggest playing around on different Marketing Mix and see what works best for your strategy and budget. Your Sales Promotion strategy will need to vary with the Life Cycle of your product. For instance, Trade Shows and Sales Force training will be important a new product launch, bur progressively less so as the product ages. Your existing product will be in the Mature phase of its life cycle for your first Sales Promotion decision (Sales Promotion decisions are available after the 1st rollover). It is important that you get your Sales Promotion Mix right, because it helps boost your distribution coverage and distribution index. In addition, some segments are particularly sensitive to Distribution, such as the Standard Segment. So, how do I choose a Sales Promotion Mix for my products? Remember that each of your products will progress through the Product Life Cycle starting in the Growth phase for new products and then gradually progressing through to the Decline stage over the next six rollovers. You should buy the Distribution Coverage and Sales Promotion Market Research report for detailed information on the Sales Promotion Rating and Stage of Product Life Cycle for all firms in the Industry. 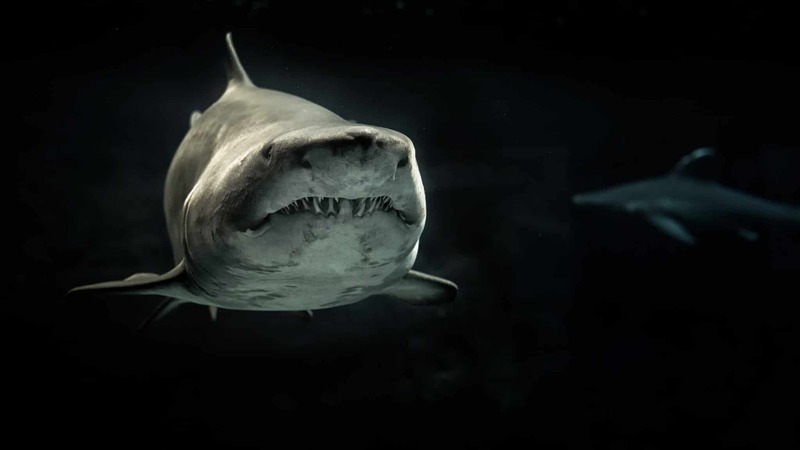 “During a research experiment a marine biologist placed a shark into a large holding tank and then released several small bait fish into the tank. As you would expect, the shark quickly swam around the tank, attacked and ate the smaller fish. The marine biologist then inserted a strong piece of clear fiberglass into the tank, creating two separate partitions. She then put the shark on one side of the fiberglass and a new set of bait fish on the other. Again, the shark quickly attacked. This time, however, the shark slammed into the fiberglass divider and bounced off. Undeterred, the shark kept repeating this behavior every few minutes to no avail. Meanwhile, the bait fish swam around unharmed in the second partition. Eventually, about an hour into the experiment, the shark gave up. This experiment was repeated several dozen times over the next few weeks. Each time, the shark got less aggressive and made fewer attempts to attack the bait fish, until eventually the shark got tired of hitting the fiberglass divider and simply stopped attacking altogether. The short story above is by Marc Chernoff. What do you think is the moral lesson of this story? The lesson here is many of us give up after experiencing failures. Like the shark story, we believe that if we were unsuccessful in the past, then we will always be unsuccessful. We continue to see barrier in our heads, even when there are no “real” barriers. So you are probably reading this article because you want to get out of a situation where you have made mistakes in the simulation and want to fix it, right? Good on you for crossing that barrier! We cannot reiterate enough how important this is. Many students want to “save” their budget and invest it in other areas in the simulation. However, knowledge is power and by investing in these paid reports, you are making more informed decisions. Your budget does not carryover to the next year, so it is important that you spend the entire Marketing Budget that you have been given for the current year. Price is usually a key determinant of demand and is the most critical component to maximizing your revenue. Therefore, carefully thinking about your Pricing strategy is important as this would have an impact on the demand for your products. Check out this article on How to Set Retailer Price and Retailer Margin for your products. Part 2 talks about Misunderstanding the importance of reaching the right customers and inaccurately allocating your Sales Promotion Mix. Distribution (place) relates to the ability of the firm to make products accessible to its target segments. This is achieved through distribution channels – in this case through retail outlets. The number of stores in the channel that decide to stock your products will depend on the retail price, margin, unit sales history, and extra support offered. 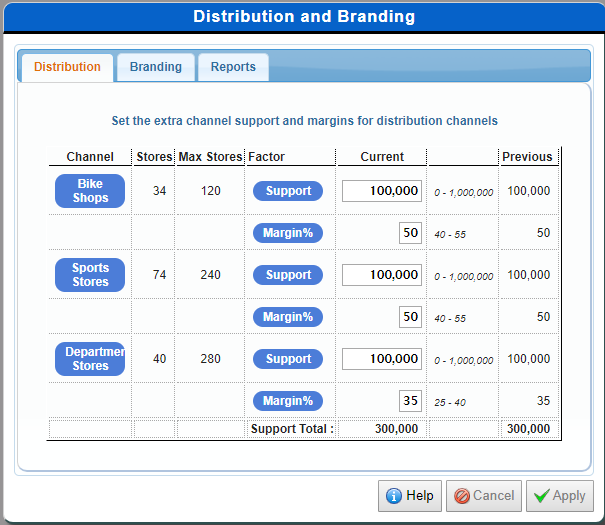 You must specify what margin and what extra support you are going to offer the retailers in each channel. What is Retail Margin and Extra Support ($)? The retailer margin decision refers to the percentage of the retail price that the retailer keeps. So don’t increase it too much! Example, if your bike is priced at $1,000 and your retail margin is 40%, then the wholesale price that you receive for each bike is only $600. Maintaining existing distributors and acquiring new ones require considerable resources. Extra Support (e.g. in terms of special promotions and discounts) costs are required to enable product training of retailers and providing promotional literature. Distribution costs vary based on the number of stores that currently stock your products. Your challenge is to decide how to set price and distributor retail margins in order to influence your distribution coverage in a way that results in either increased market share or increased profit. Your distributors look at how much total retail margin they make from stocking all of your products and based on this they decide how many stores will stock your products. This then translates into a Distribution Index which ranges from 0 to 1 (higher is better). In general as your distributors make more money from selling your products, then more stores will stock them and your Distribution Index will increase. 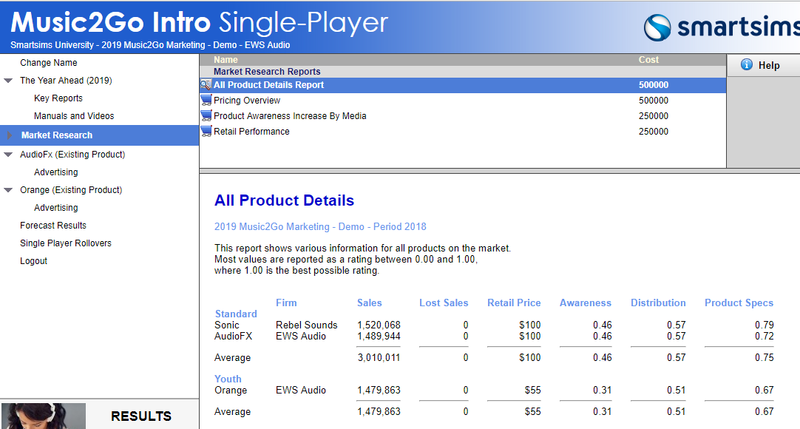 Note: The market segments all have medium sensitivity to Distribution apart from the Commuter segment, which has low sensitivity to distribution (see the Market Information report under the Key Reports menu). In this case, your Distribution Index would fall slightly as your distributors made less retail margin in total. This may not be an issue in the Commuter market, but it may disadvantage you in the other market segments. Of course, it also depends on your competitors’ actions. If your competitors have much higher distribution indexes than you, then you will lose more market share. As you can see, sales volume is also an important component of distribution. So it may be beneficial to keep retail margins slightly higher whilst building initial market share for new products. It may be possible to gradually reduce margins once you have established products with high sales volumes without adversely affecting your Distribution Index. Why did my Product Development Project fail? Meet Peter Johnson, an Intro to Business student from Des Moines Area Community College. He managed to land the Top 7 spot in the MikesBikes Introduction Hall of Fame last Fall. We interviewed Peter to learn about his decision-making, strategy and what resources he used to help him succeed in the simulation. What is your decision-making process within the simulation? My decision-making process always began with reading the business reports to base my decisions off of. When looking over the reports, I would also take notice of what my competition was doing. Analyzing this information was very helpful in every new decision I made especially when expanding my product line. I would then adjust my numbers for production and available units for sale. Next, I would tend to my advertising in each market. I spent quite a bit of money on advertising, but it worked well for me. In addition, I invested in many company and product improvements such as efficiency and quality. When able, I would pay dividends and repurchase equity as well. For the most part, this decision-making process remained routine for me through each simulation rollover. What was your strategy going into the simulation? My strategy for the simulation was to increase shareholder value by boosting sales and maximizing profits. To do so, I wanted to grow my company by expanding the product line and by investing more money in advertising to grow my brand and gain a competitive edge. I knew I wanted to separate myself from the competition and an increase in advertising was my first step in accomplishing that. How did you begin implementing that strategy? I implemented that strategy by immediately increasing the money I spent on advertising. I paid attention to the market reports to allocate my advertising expenses effectively for each market. I also looked for ways to improve the products and company along the way. For example, I invested in efficiency and quality when given the opportunity to do so. Also, market reports helped me make tailor made product improvements according to the expectations of each corresponding market. How did you familiarize yourself with the simulation? I watched the instructional videos and looked through the various reports available. I took advantage of my practice time with the simulation. During this time, I was able to make decisions according to information I read in the reports and see how the results of my decisions would play out in the simulation. Seeing how these decisions would positively or negatively affect my business was very helpful. How would you describe the competition? I would describe the competition as a high priority. In my opinion, it is equally important to pay attention to what your competition is doing as much as it is to pay attention to what your own company is doing. You can definitely create competitive advantages for your business depending on what your competition is doing or not doing. What resources did you pull on to develop your winning strategy which led you to the top of your course and then top in the Hall of Fame? Utilizing the reports made available to me in this simulation was crucial in developing a winning strategy. The information they provide allowed me to refine my decisions along the way and improve the accuracy of those decisions. Also, keeping an eye on my competition proved to be more valuable than I had originally anticipated. What challenges did you face? How did you overcome these? Lost sales became a challenge for me on more than one occasion. Every time I expanded my product line, I incurred lost sales in each of the new markets. To correct this, I increased the number of units available for sale in each of those markets. Occasionally, I would have to buy more SCU to produce more units. Paying attention to my market share and future market demand helped me eliminate lost sales. Was there anything in particular you did that you think helped to prepare yourself? I think taking advantage of the practice time to learn about the simulation really helped me. Getting to know the reports available and the information they contain are advantageous in making solid decisions and taking informed calculated risks. How has participating within a course which uses a business simulation to supplement their teaching materials helped you? What do you think of the business simulation? I think it helped me in learning about and understanding how to read various business reports. It is important to know what information to look for when making any decision for your company. The interactive platform is a great way to experience making decisions for a business and seeing the outcome of those decisions. I really enjoyed my experience with the Mike’s Bikes simulation. Engaging in the simulation is an interesting and fun way to learn. It provided me with valuable tools and experience when addressing a company’s business decision making process. Being that every Mike’s Bikes experience is unique to that user, it is a simulation I would participate in again. 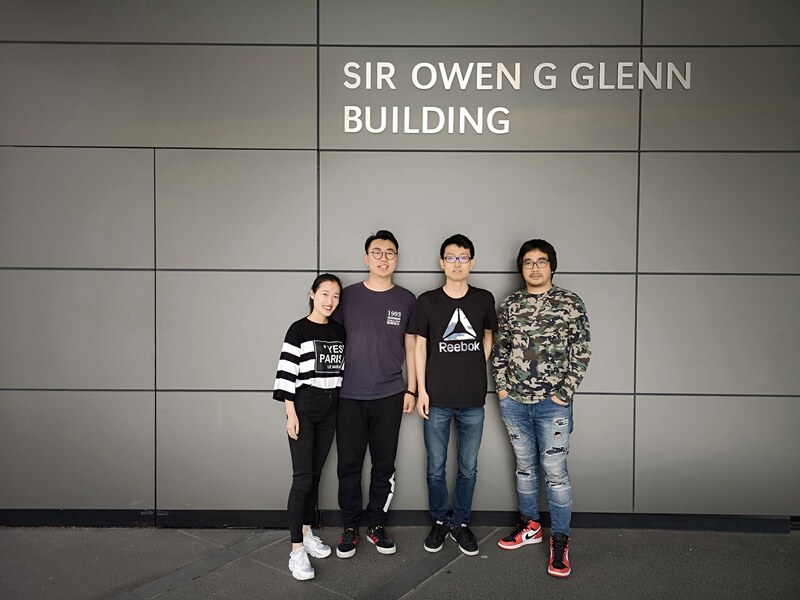 We have interviewed the 2018 MikesBikes World Champs winner, Whatever-Go with Wiput Tantulaphongse, Yijing Tang, Meiyicong Lin, Zhen Peng and Fengkai Han from University of Auckland. They have also managed to achieve the second highest Shareholder Value from the past 9 MikesBikes World Champs! In this interview they talk about their experience in the simulation, their decision-making process, strategy and advice to future students. Smartsims: What is your decision making process within the simulation and in the competition? Whatever-Go: First of all, we look at the information in the Scenario Tab then we discuss about the strategy of the investment. The decision was based on the forecast market volume and the expected market share of our team. The expected market share is derived from the advertising expenditure and the target price. Moreover, we calculated the capacity needed to produce the expected amount of bikes two years in the future. The last decision made on the financial aspect. We simulated cash flow analysis and expected equity in the next rollover, so, we had the rough idea of how our cash on hand would be, and the likelihood of achieving that target. All of the decision made was influenced by the forecast of competitors’ decision as well. Smartsims: What was your strategy going into the simulation? Whatever-Go: Our strategy is to be the market leaders who produced high quality products with reasonable price. This strategy needs a thorough analysis of every aspect including marketing, product development, financing, and production as a whole. We had to understand the risk of each decision made in the particular rollover. We invested heavily in product development and advertisement in the first three rollovers because we expected to secure the highest market share earlier than our competitors. The forecast of the cash balance was really important to understand the sensitivity of financial information. For example, if the expected market share change by 1%, we need to know how this would affect the ending cash balance. So, we can prepare the financing strategy whether we should take debt or equity financing. In the middle of the competition, we focused on optimizing the operation activities and maintaining a reasonable market share regardless of the price of products. We estimated the contribution margin of each product to ensure that every single product lines made the profit the team. Every rollover, we aim for the highest profit which is the ultimate goal of a business. Moreover, we also focused on giving the dividend to shareholders. For the last two rollovers, we invested in investor PR to help our SHV and tried to maintain the investor PR index at 1 which is the optimal point. Smartsims: What challenges did you face? How did you overcome these? Whatever-Go: The most challenging part is the first three rollovers. First rollover: We were not sure what the price of the Adventurer bike would be. If we set the price too high, it would lead to having a low profit in the following rollover. If we set the price too low, we could end up with loss sales which means loss of profits. In addition, we had to come up with the strategy for our product development. We had to guess which market to place the bike into. Finally, we decided to develop Adventurer and Kids bikes. We made the decision based on the profitability of Adventurer in the long run because we can double the profit of the Adventurer segment by investing 2-3 million. For kids segment, we had the assumption that most of the competitors would develop Racers. We decided to take a risk in developing a product in the Kids segment. The assumption in that moment was to take 30%-50% of kids market and gain a huge amount of profit rather competing in the “red ocean market” of Racers segment. Second and Third rollovers: It was challenge to guess the competitors’ strategy. We had to estimate and monitor changes in price, awareness, PR, and quality of our competitors’ product. This helped us to understand the trend of each competitors and we adjusted our plan accordingly. For both situations, teamwork is the answer to overcome all of these challenging issues. 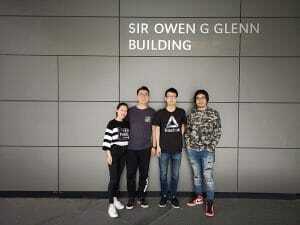 The more we share to the team, the more solutions we came up with. Smartsims: Was there anything, in particular, you did that you think helped to prepare yourself? Whatever-Go: Cash flow analysis, cash balance sensitivity analysis, product development plan (for the whole simulation period), and the most important part is to understand how advertising, operations, finance and product development are linked together, and how the simulation software works. Read the Players Manual!!! Smartsims: What do you think of the business simulation? Whatever-Go: The simulation needs comprehensive decision making method. This is one of the best activities we have done so far throughout the course. MikesBikes shows every single element in the accounting perspective such as balance sheet, cash flow statements, statement of change in equity, and the costing information for management accounting. This is the good experience for management students so far. Whatever-Go: We had fun in the course and found that in MikesBikes World Champs is far more challenging because of the additional rules such as the limitation of numbers of development in a roll. Whatever-Go: Focus on your business strategy, set the target, think about the plan to achieve the target, adjust your decisions based on the business environment, focus on every aspect equally (advertising, operations, finance, R&D) because each decision supports each other and contribute to your overall Shareholder Value. What is the Industry Benchmark Report? The Industry Benchmark Report is a summary of all firms’ Net Marketing Contribution reports so that you can benchmark yourself against your competitors as shown in the figure below. In real life, this information would be difficult to obtain, but this report has been made available to you so that you can learn from your competitor(s). There are several key parts of this report that you need to understand. The Sales Revenue listed for each is the total wholesale sales revenue of all the firm’s products. The Cost of Goods Sold is the total cost of goods sold of all of the firm’s products that were sold, which is the number of units of a particular product sold multiplied by its manufacturing cost. Gross Margin is the amount of profit that each firm made after the manufacturing costs were deducted. You have no control over either the wholesale price or the manufacturing cost of your product, so your aim to maximize sales revenue by running the most cost effective advertising campaign that you can. 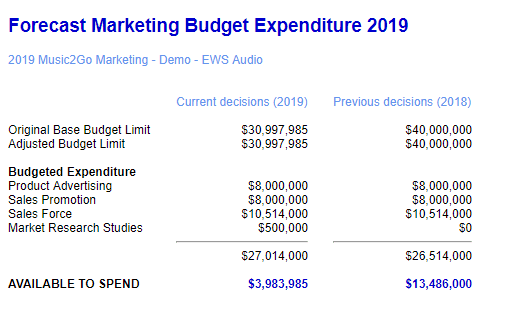 This section shows the combined Market Research, Agency Fees, Media Advertising, Customer Relationship and Marketing Communications expenditure for each firm. The Evaluation Research expenditure lets you know how much market research your competitors are purchasing. The Agency Fees let you know whether your competitors are using an Agency or not and how much it is costing them. The Media Advertising expenditure allows you to see how much money your competitors are spending on Advertising, but now how they are allocating it to each media type. Customer Relationship and Marketing Communications expenditure lets you know how much your competitors spent on implementing their selected options. Net Marketing Contribution is the amount of profit remaining after manufacturing (cost of goods sold) and marketing expenditures have been deducted. The only costs still to be deducted are other functional overhead costs for your firm, e.g. finance, administration, etc. Net Marketing Contribution is a measure of how profitable your firm is as a result of its strategic marketing plan. There is only one way that you can improve it, increase your Sales Revenue per dollar of Marketing Expenditure.